Compatible with iPhone 8/7/6s/6 (4.7inch). Able for 3.5mm headphone jack output audio(only for listening music) while charging. Integrated 3000-mAh battery let your cell phone have 2x battery life, with auto-stop charge once your phone reaches 100% and LED Power Light instruction, See how much charge is left with the LED light at the back of the phone. Functional style design, And high impact protection,High quality hard case to protect your phone from drops, dust and scratches. Portable for carry on, There are ridges on the back side to help cellphone grip the surface, enhances with the anti skid design. Integrate circuit design effective to prevent short circuit or overtime charging or even the mis-operation under harsh environment. Insert cellphone case and connect the cellphone cable with battery, Then connect the other end of USB cable with USB power port (such as computer USB port) to charge external battery. When charging the LED will flicker and indicate power of the external battery. There is a button on the back of the battery case, single press to turn on the mobile power output, double press to turn off the power output. For other details, please refer to the manual. 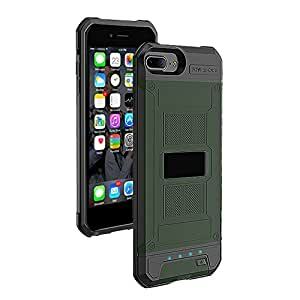 Q: Can the Case protect my phone? A: Yes, the outer shell bumper and the case protects your phone from all-around, making it shock-proof. But DONâT drop self-disassemble or puncture the battery case,Donât place the battery into the fire,high-temperature of water. Q: How much extra battery does battery Case provide for iPhone? A: The battery case provides additional 3000mAh battery for iPhone which is equivalent to 125% of battery life. Q: How long does it take to charge the Case and Phone? A: It takes about 3-4 hours to fully charge the Case, and 3-4 hours to fully charge the iPhone. Q: Does the battery case can work with cable headphones? A: For iPhone 6/6S, it can works directly with cable headphone. But for iPhone7 Plus, it can ONLY compatible with Bluetooth headphones or any other wireless connected headphone accessories.